The inaugural CASL Conference is a unique event designed to encourage bold new ways of thinking about how the drive and capacity for communication emerges. By considering the nature of communication in communities of individuals with Autism Spectrum Disorders and those who use Sign Language, CASL aims to improve the quality of life and humanistic appreciation of individuals for whom social communication can sometimes be difficult. The insights that emerge from this workshop are meant to aid in decreasing social challenges for these groups. CASL features three groups of world-renowned researchers from around the country: a group of linguists who devote their careers to the study of sign languages; a group of researchers who study communicative abilities in autism; and a group of scholars who have begun to explore the connection between the two areas of research. In addition, the workshop engages and includes members of the community (from New York and beyond) who themselves identify as having autism. SUNY students are also invited to attend this conference, which excites their interest in service-centered applied research and learning. The 2nd annual CASL conference will be held in December 2015! SUNY Old Westbury hosted this year’s Regional Autism Conference, where SCTL Director Dr. Matthew Lerner spoke about Autism Spectrum Disorders and the research done by the SCTL team here at Stony Brook University. The 48th Annual ABCT convention took place in Philadelphia. ABCT is multidisciplinary organization whose goal is to enhance human functioning through behavioral, cognitive, and other evidence-based principles and therapies. 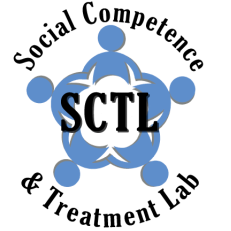 SCTL Director, Dr. Matthew Lerner, is co-Chair of the Autism Spectrum and Developmental Disorders (ASDD) Special Interest Group (SIG). This SIG is committed to sharing and disseminating recent findings and ideas related to ASD and developmental disorders, as well as promoting training in evidence-based methodologies in across psychosocial interventions for this population. For more information, or to join the ASDD SIG, visit the SIG website. The Stony Brook Center for Embodied Cognition hosted a unique event exploring the use of theater techniques to aid in social development among children with autism. In collaboration with the University of Kent's Imagining Autism program, this symposium explored various novel theatrical techniques, and opportunities for novel collaboration. The SCTL was a co-sponsor of this event. The SCTL teamed up with the SBU Department of Public Health to host a talk by Mollie Wood, titled “Prenatal Predictors Talk”, from University of Massachusetts Medical School. Ms. Wood discussed prenatal predictors of chronic illnesses. For more information about the talk, view the flyer here. Science on Tap is a live, award-winning show and web series produced by Stony Brook University’s Alan Alda Center for Communicating Science that discusses scientific matters in a casual, laid back setting. During this episode featuring SCTL Director Dr. Matthew Lerner, they sat down to discuss Autism Spectrum Disorders, and what interventions work best and why. This event occurred at the Hilton Garden Inn located on Stony Brook University’s Campus and was open to the public. For more information, check out the flyer. The evening was a blast, and we hope you made it! If not though, you can view the web episode here. The Asperger Syndrome & High Functioning Autism Association hosted their 24th annual fall conference this October. This two day conference focused on the social, educational and behavioral issues for students who are on the Autism Spectrum, and provide insighted into the stresses and challenges of students with ASD. This year’s two keynote speakers were Amy Gravino & Alex Plank, individuals who are on the Autism Spectrum and shared their personal experiences, struggles, and how they overcame them. The Social Competence & Treatment Lab was present in the audience at this event. We will be back at AHA’s Spring conference event as well, holding an informational table. For more information and to look out for the Spring event, visit AHANY's page. Psychology Honors student, James Rankin, represented the SCTL at this year’s NYSABA Conference in Saratoga Springs, NY. His poster presentation, “Interventions for Maladaptive Behaviors: Predictors and Implications for Adolescents with Autism Spectrum Disorders,” is co-authored by: Christine Spaulding, Megan E. Tudor, Tamara Rosen (Stony Brook University), Allison Jack (Yale Child Study Center), and Matthew D. Lerner. The SCTL Team again joined the Autism Awareness Club of Stony Brook University to hold a table at the Riverhead Fall Festival. Children decorated puzzle pieces to create a mural in the Stony Brook University Psychology building. Members of the SCTL teamed up with Stony Brook University’s Autism Awareness Club to hold a fundraiser at The Park Bench & Grill in Stony Brook. Proceeds benefit autism research and outreach efforts.